In his book ‘Outliers’, Malcom Gladwell makes an uncomfortably convincing argument that society favours the young who develop fast at the expense of everyone else. He used Ice Hockey junior development squads to illustrate this point and by extension suggests that, if we just treated everyone with more equality for longer, the talent pool would present itself as a great deal larger when it really matters. I‘ve been thinking about this all week and I’ve come to the inescapable conclusion that my own experience illustrates this point all too well. When I was teaching in Japan my approach to working with students needed to be fundamentally different to that which I used with students here in Australia. I know this is a breathtakingly obvious generalisation but it was especially true when running class discussion. This is a feature of my teaching that has always been strong. I have long prided myself on an ability to run an interesting and insightful classroom forum or debate or Q&A. Not that this is hard to do here anyway. Generally speaking the students I encounter in suburban Melbourne are not backward in coming forward. I am a part of a community and my place is no more important than anyone else here. My actions will reflect on the community as well as me. Where my actions contribute to the status of the community I am in the right. Where my actions single me out as above or better than the community I am in the wrong. In Japan I worked with Kindergarten, Elementary and Junior High school students. I have no idea how, but some sort of switch was flicked when kids put on a junior high uniform and this code kicked in. It meant that my questions were not going to be answered because the first person to put up their hand would not be thought of as an engaged learner, they would be thought of as a smarty pants know all who considers themselves better than the rest. A truly appalling concept to those children. In the weeks it took to work this out I persisted in waiting for some poor student to take the initiative. Inevitably they wouldn’t so then I’d pick on the same small number of kids whose only crime was to be seated in the areas of the room I tended to look at a lot. When I finally worked out what was going on I wanted to go in and apologise for my insensitivity … only that would’ve made it worse. Still, once I realised what was going on, the solution turned out to be staring me in the face quite literally. Across the top of the back wall of every classroom in every school that I ever visited (and I got around) was a class list. It was always in kanji (which is why I didn’t catch on immediately) and every name had a number. Obviously this list wasn’t alphabetised but there was a pattern to it and all the students were seated in a way that illustrated it. Bingo…literally! The solution was bingo. A variation of it anyway. I made a set of cards from 1 to 40 so that whenever I needed to call on a student I would take the card from the top of the deck and the student with that number in the room would be called on to attempt an answer. Suddenly being called on to speak publically was a truly random occurrence that the students found quite exciting. Now answering my questions wasn’t an act of self-aggrandisement, it was one’s duty. In fact, to answer poorly would be letting down the team. What’s more, since everyone knew their turn was inevitably coming around during the lesson, everyone needed to be alert and engaged at least until their turn had come. It worked brilliantly. But, having devised this … I then stopped using it. Upon returning to Melbourne the hands of enough students shot up again of their own volition. My rapid fire Socratic style went back to full speed and I returned to lazy habits. I relied on the few to answer the bulk of my leading questions. Occasionally I’d call on a quiet student but it felt like I was picking on them and so generally those students who wanted to fly under the radar were, at least on this one level of my tutelage, allowed to do so. I still used a variation on the theme from time to time but it was infrequent. Whenever I needed to generate an order for class presentations for example I’d pull out names from two cups. 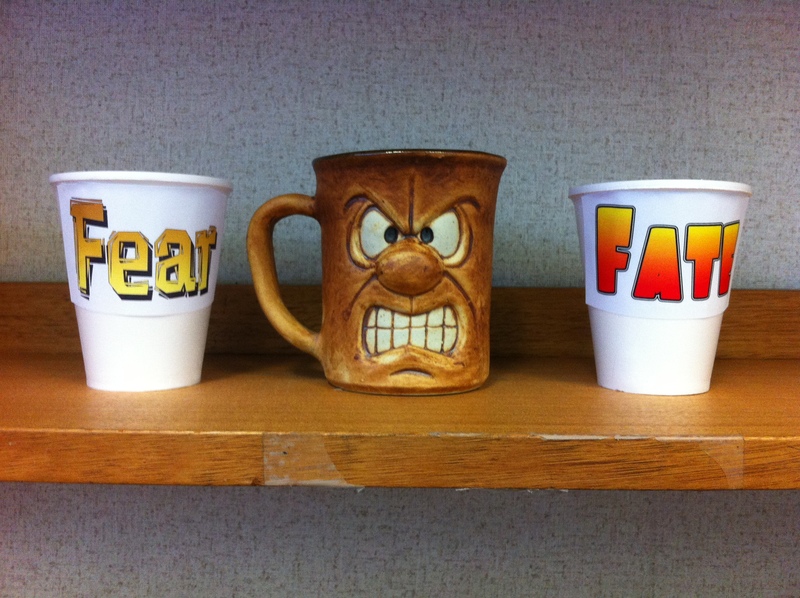 I called them ‘The cups of fear and fate’. After a while I replaced this with ‘the grumpy god mug’ (a questionable Christmas present from one of my brothers). For years now, I’ve been calling on a select few who prefer or enjoy answering questions in class. Meanwhile there’s been a significant fraction of every room sitting quietly in varying degrees of passive disengagement. These quiet ones aren’t lazy, but they aren’t being properly challenged either. That’s where I should come in. That’s my job. Time to put a stop to that. From now on it’s back to bingo and no one gets missed. This entry was posted in Education, Japan, Learning, Professional, Teaching and tagged #WPLongform, class discussion, classroom management, Malcolm Gladwell, Outliers, teaching and learning, Teaching in Japan, Teaching styles by sterlinghurley. Bookmark the permalink. Interesting! I’m so glad you found a way to help your Japanese class get over their inhibitions about putting themselves forward to see what they were thinking underneath. Thanks Denise. It was an eye opening time. The girls I taught benefitted especially from the arrangement. They were so clever and so keen to get involved but very cautious.